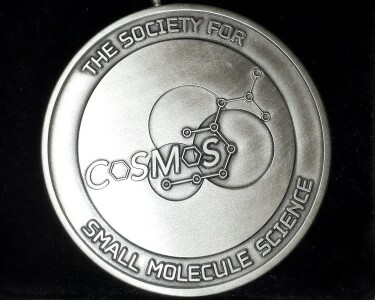 Our chemistry method development (in collaboration with Novatia, LLC) for identification, extraction and quantitation of Vitamin D3 from commercial supplements received the silver medal at the CoSMoS Method Development Olympics yesterday. We solved the structure of the unknown in less than 2 hours using NMR, MS, and searching with free, online databases. Pfizer fully assigned the structure using multidimensional spectroscopy from first principles. We developed a simplified, expedient extraction procedure by combining features of literature methods. Pfizer exhaustively screened solvents and conditions to develop a unique and fully optimized protocol. Our quantitative analysis of the commercial tablets (400 IU) used a similar methodology to Pfizer’s, but our results (370 IU) were systematically low compared with theirs (398 IU). We attribute this to choice of standards – our choice was to use Vitamin D3 purchased from Sigma-Aldrich, as we assayed the supplied standard at ~94% potent. Pfizer used the supplied standard and assumed 100% potency. These variations in approach happen because good analysts attack problems in different ways. We could argue in favor of any of the choices made by either group. That’s what makes this field so much fun. Congratulations to Pfizer and all the othe participants. See you next year!